Once you arrive in our modern, well-stocked store, you'll find experienced, knowledgeable sales associates to help you locate what you need or answer your questions about a particular problem. CK Home & Hardware is an independent family-owned business where old-fashioned service and quality remain a no. 1 priority. We will continually strive to make CK Home & Hardware a favorite among area customers. As a member of the True Value cooperative we will have access to more than 60,000 products. Our wide selection of merchandise includes: hardware & tools, paint, houseware & gifts, patio furniture, lawn & garden supplies as well as plumbing & electrical goods. The next time you go shopping, make CK Home & Hardware your first stop. We understand the economic hard times in our community and we at CK Home & Hardware are committed to doing our part. To serve the community we love and assist customers during this economic crisis we have done our homework. We feel becoming an True Value member, with their enormous buying power would allow us to assist you to stand up to the economic challenges that face us all. The prices you see will not affect the service. 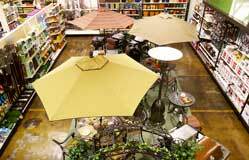 We are not just another home and hardware store we are your local; one stop shop experience.